Every seal press consists of two die plates - the positive (female) and the negative (male). For the positive die plate (displayed as black text/graphics on a white background in the graphics program) the black elements are engraved into the Delrin material. For the negative die plate on the other hand (displayed as white text/graphics on a black background in the graphics program) the entire black surface is ablated by the laser. Consequently, the created text or graphic appears raised on the die plate. The two die plates need to fit perfectly in each other to achieve perfect relief print quality. That's why the text/graphic elements must be produced slightly enlarged on the positive (female) plate. There is no need to adapt the size of the female plate manually. 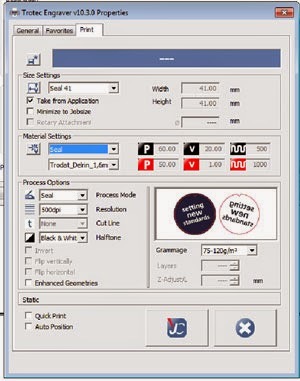 JobControl X (from version 10.3 on-wards) automatically creates the positive (female) and the negative (male) die plate with only one click by choosing the process type "Seal" in the Trotec print driver. 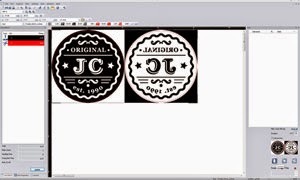 In this example, the graphics are created in CorelDRAW. 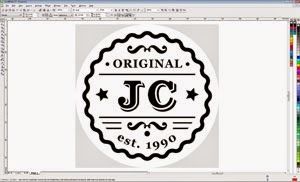 However, any other graphics program, such as Adobe Illustrator, Freehand, etc., may also be used. Please note that you don't have to draw the outer cutting line and the positioning nose (triangle recess), JobControl X will do this for you, allowing you to focus on the elements inside the cutting line - your layout. JobControl X also automatically enlarges the elements according to the selected paper thickness for the positive (female) die plate. In the JobControl X software, we provide predefined seal templates according to current seal sizes available on the market. Send your graphic design to the laser by using the Trotec print driver. Your seal job now appears in your job queue; double click to position the job on the plate at 0/0. Job preview is available of the negative (male) and positive (female) die plate, notice that JobControl automatically created the positive plate, the cut line, and the positioning nose. Now connect to your laser machine and start the laser process. After the laser processing, you just need to clean the die plates, pate them into the seal press and then you can already emboss the paper. Simply wash the finished Delrin die plates with water and a little soap or dish liquid and wipe off any still adhering dust with a brush (clean using compressed air if necessary). The die plates can be quickly pasted into the seal press using the supplied doubled-sided adhesive circles. 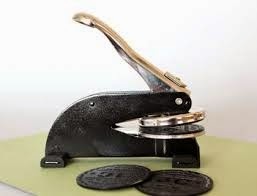 The recessed die plate is pasted onto the top and the die plate with the raised text is pasted onto the bottom (at the holes punched into the seal press itself).